Context: Yoga is a popular mind-body program designed to improve muscular endurance, core stability, flexibility, and balance. Some styles of yoga appear to provide mild cardiovascular stimulus which may enhance cardiovascular endurance when performed regularly. Few studies have compared training intensity of different yoga styles. Aims: The aim of this study is to examine training intensity, caloric expenditure, and acute psychological response to three different styles of yoga (i.e., Dynamic, Hatha, and Gentle Yoga). Settings and Design: This was a quasi-experimental, within-group repeated measures design. Subjects and Methods: Eight young females (M = 19.24, standard deviation = 1.82) performed three yoga styles on separate occasions. Each participant wore chest-mounted heart rate (HR) monitor to record physiological data (i.e., average HR, maximum HR, calorie expenditure, training duration, and percentage of time within the 5 Polar-defined training zones). Participants filled out the Exercise-induced Feeling Inventory before and after each session. Statistical Analysis Used: Analysis was done using nonparametric statistical tests. Results: Wilcoxon signed-rank test revealed significant differences in the average HR, calorie expenditure per minute, and time spent in Zone 2 (moderate intensity) between yoga styles. Follow-up analyses indicated that these physiological variables were higher in Dynamic Yoga compared to Hatha and Gentle. For psychological response, higher change in tranquility score was observed in Gentle Yoga compared to Hatha and Dynamic. Conclusions: This study concludes that different yoga styles elicit different training intensities and psychological response and extends current knowledge suggesting that health and fitness benefits of yoga may differ by style. Yoga, a mind-body discipline which originated in India some 5000 years ago, has become one of the most popular forms of exercise and fitness activity since 2008 (Thompson, 2017). As an exercise activity, it is generally composed of postures, breathing, and meditation or relaxation (Cramer, Lauche, & Dobos, 2014), and research on its health benefits has increased over the years (Cramer et al., 2014). Available evidence suggest that benefits of yoga may not differ by style (Cramer, Lauche, Langhorst, & Dobos, 2016), but yoga styles that are dynamic or incorporate sequences like the sun salutation may meet the requirement for moderate-intensity physical activity and therefore may have some mild cardiovascular benefits (Mody, 2011). Cramer et al. (2016) conducted a systematic review of randomized controlled trials (RCTs) to determine if positive benefits of yoga differ by style. They found 52 different yoga styles from the 306 RCTs that they included in their review. They concluded that the positive benefits of yoga do not depend on the style. However, this review included a wide variety of physiological and psychological outcomes in both healthy participants and those with clinical conditions. They also cautioned that their conclusion might be applicable only to those most commonly used yoga styles (i.e., Hatha Yoga, Iyengar Yoga, and integrated yoga therapy). Ross & Thomas (2010) discussed that the varying emphasis placed on the different components of yoga across styles make some styles more vigorous than others. They raised the need to compare the effects of different yoga styles on a variety of outcomes in both apparently healthy and clinical population. This is particularly important if the goal is to promote yoga as a health and physical activity program that will benefit public health. Yoga is generally considered as a light-intensity physical activity (Larson-Meyer, 2016). However, some dynamic styles of yoga do not hold the poses for more than 30 s, and incorporate sequences which may raise the heart rate (HR) up to moderate to vigorous intensity level (Mody, 2011; Sherman et al., 2017). Mody (2011), for example, found that four rounds or 12 min of Surya Namaskar raised the HR of the male participants up to 80% of their age-predicted maximum HR. Several studies have examined physiological responses to individual yoga styles. Sherman et al. (2017) measured metabolic cost of Vinyasa Yoga, a style of yoga that is designed around the sun salutation sequence, and found that it elicits energy expenditure similar to brisk walking and hence may count as moderate-intensity physical activity. Hagins, Moore, & Rundle (2007) did a similar study assessing metabolic cost of Hatha Yoga, a style of yoga that requires holds of longer than 60 s. They asked 20 yoga practitioners to perform 56 min of basic Hatha Yoga following a video instruction, and they found that energy expenditure of this style of yoga is equivalent to slow walking which may not provide enough stimulus to elicit cardiorespiratory response. Other studies suggest that even yoga styles that do not generally involve continuous movement (e.g., Iyengar and Bikram) may provide sufficient intensity to meet moderate-intensity physical activity requirement (Blank, 2006; Hewett, Ransdell, Gao, Petlichkoff, & Lucas, 2011). It appears that regular practice of some yoga sequences or styles, provided they are performed for at least 10 min, could count towards the recommended amount of physical activity for health benefits (Hagins et al., 2007; Larson-Meyer, 2016; Mody, 2011; Sherman et al., 2017). Very few studies had compared the physiological responses to different yoga styles (Ross & Thomas, 2010). In one study (Cowen & Adams, 2005), physical and perceptual benefits of Ashtanga and Hatha Yoga were compared over 6 weeks. Twenty-six participants (ages 20–58 years) were randomly assigned to either Ashtanga or Hatha group, and they performed their assigned yoga style for 75 min per session, twice a week. The researchers found significant improvements in blood pressure, muscular fitness, flexibility, perceived stress, and health perception in all participants. When they compared the two groups, however, the Asthanga group showed decreased blood pressure and perceived stress and increased muscular fitness (upper body and trunk), flexibility, and health perception, while the Hatha group demonstrated improved muscular fitness (trunk only) and flexibility only. Another study examined the HR differences in Ashtanga, Hatha, and Gentle Yoga (Cowen & Adams, 2007). Sixteen participants performed the three yoga styles at different times and wore Polar S610 HR monitor (HRM) to record average HRs during each session. The authors reported that the HR of Ashtanga practice is significantly different from Hatha and Gentle, suggesting that the practice of Ashtanga may improve cardiovascular health and physiological responses to different yoga styles may vary. They suggested that future studies should include psychological measures such as subjective health and well-being to have a greater understanding of yoga's benefit as a mind-body discipline. Participants in one study reported increased feelings of revitalization, positive engagement, and calmness after one session of Hatha Yoga (Smith, Greer, Sheets, & Watson, 2011). It remains unclear if these affective changes can be observed in other styles of yoga. As with other forms of physical activity, yoga may address the increasing lifestyle-related diseases worldwide, and the World Health Organization (2013) supports its promotion as a “holistic” approach to health and well-being. Yoga has been found to be as effective as conventional exercise (Ross & Thomas, 2010), and people choose to do yoga not only for its health and fitness benefits but also for its potential to enhance spirituality (Park, Riley, Bedesin, & Stewart, 2016). However, potential practitioners may avoid yoga because it is perceived either as too physically challenging or not challenging enough (Spadola et al., 2017). Studies that compare the various yoga styles are needed to inform yoga practitioners, teachers, studio owners, or health promotion leaders on what style of yoga would fit their health and fitness goals. Therefore, the aim of this study was to determine the physiological and psychological responses to three different styles of yoga as performed by novice practitioners. Specifically, training intensity, energy expenditure, and acute psychological response were observed during and after the performance of Dynamic Yoga, Hatha Yoga, and Gentle Yoga. Eight (n = 8) apparently healthy young female adults (M = 18.63, standard deviation = 2.13) participated in this study. All participants had no prior experience with yoga (i.e., Novice Yoga practitioners). Participants completed informed consent form, health questionnaire, and physical activity readiness assessment. They were apparently healthy based on the preparticipation assessments and consequently performed the submaximal step test to assess their cardiovascular fitness (Bennett, Parfitt, Davison, & Eston, 2016; McArdle, Pechar, Katch, & Magel, 1973). [Table 1] shows the anthropometric profile and fitness level of the participants. All procedures were in accordance with the ethical principles stated in the Declaration of Helsinki (World Medical Association, 2013). This model is sensitive in measuring HR at rest and at low exercise intensities (Polar Electro, 2018a). The participants were briefed on the study protocol and were taught how to wear the HRM. Each participant was assigned individual HRM and instructed to wear the device before the start of each session. All HRMs were connected to the Polar team app (Polar Electro, 2018c) iOS version via Bluetooth which allowed simultaneous multiple HR recordings. The author controlled the app from a tablet. Data recorded from this app include the following: average HR, maximum HR, total energy expenditure, and percentage of time spent in different training zones (Polar Electro, 2018 b). Before and after each session, the participants were asked to answer a brief questionnaire to record their feelings and changes in mood states as results of engaging in yoga. This 12-item inventory was developed to assess four feelings associated with acute exercise: positive engagement (enthusiastic, happy, and upbeat), revitalization (energetic, refreshed, and revived), tranquility (calm, peaceful, and relaxed), and physical exhaustion (tired, worn out, and fatigued) (Gauvin & Rejeski, 1993). Participants were asked to rate each item based on “how they feel at this moment in time.” Each item was rated on a scale of 0 (do not feel at all) to 4 (feel very strongly). The participants performed three 40-min yoga routines (i.e., Dynamic, Hatha, and Gentle) in three separate sessions with at least 2 days of rest in between testing. Details of these routines are described below. Dynamic Yoga refers to a moderately intense yoga style characterized by flowing movement practice (Devereux, 1999). The classical form of Dynamic Yoga is the method taught by Sri K. Pattabhi Jois of Mysore, India (Jois, 2010), and this form was taught to the participants. Basic Ashtanga sequence includes the 9-step sun salutation series, 17-step sun salutation series, 9 standing poses, 2 seated poses, 1 backbend pose and a counter-stretch pose, 3 closing poses, and a relaxation pose. Each pose is held for 5 breaths which is roughly equivalent to 30 s.
The basic Sivananda Yoga syllabus includes the relaxation pose, two breathing exercises, the arm and leg raises, the classical 12-step sun salutation sequence, 12 standard poses (held 30–60 s), and a guided meditation (The Sivananda Yoga Center, 2000). This session was based on a yoga therapy program that included joint-freeing exercises and restorative yoga poses (Stiles, 2000). Gentle Yoga classes are designed to focus on relaxed breathing, inner awareness, and physical relaxation. Poses were held for 3–5 min, and the session ended with a 10-min savasana, a relaxation pose in supine position. Approval to conduct this study was obtained from the University's Department of Physical Education. After the preliminary teaching of the different yoga routines, all the participants were instructed to follow a standard pretesting protocol (i.e., no heavy meals, no alcohol, and caffeine intake 3 h before testing, taking adequate rest) (American College of Sports Medicine, 2010). Participants wore HRM to record the physiological data during performance of the three different yoga routines. At the start of each session, the participants lied down in savasana for 5 min. At the end of this rest period, the participants completed one copy of the Exercise-induced Feeling Inventory (EFI) to record their feelings before starting the session. On completion, the researcher started recording the HR and the participants performed the asanas as instructed. After the 40-min session, the participants completed another copy of the EFI inventory to record their postexercise mood states. This procedure was repeated three times with 2 days in between the trials. Data were analyzed using SPSS Statistics (IBM Corp., IBM SPSS Statistics for Windows, Version 24.0. Armonk, NY: USA). Due to the small sample size and wide variances in scores, nonparametric statistics was used to examine group differences (Corder & Foreman, 2014). Friedman tests were used to compare physiological and psychological data between yoga styles. Significance was set at p < 0.05. Where follow-up analyses were required, Wilcoxon signed-rank tests were used and Bonferroni adjustment was applied to reduce Type I error. This study used a quasi-experimental, single-group repeated measures design to determine the training response to each yoga style. Training intensity and energy expenditure during the performance of the different yoga styles were recorded using HRM device, while changes in mood was assessed using a short paper and pen inventory. Descriptive statistics of all physiological data are reported in [Table 2]. Both average HR and maximum HR data suggest that all three yoga styles were of very light intensity. This is also supported by examining the data on time spent on each training zone that show training intensity barely reaching moderate-intensity level (i.e., Zone 3). The compendium of physical activities indicates that yoga is generally a light-intensity activity (2.3–2.5 METS) with an exception of power yoga which is a moderate-intensity physical activity (4.0 METS) (Ainsworth et al., 2011). Each of these physiological variables was then compared by yoga style. Average HR, per minute calorie expenditure, and percentage of time spent in different training zones in three yoga styles were compared using separate Friedman tests. Bonferroni correction was applied to the p value of the follow-up analyses (i.e., standard p = 0.05 was divided by 3 resulting to the corrected p = 0.02). Pairwise comparison using Wilcoxon signed-rank tests were used to follow up significant results from Friedman tests. Average HR in the three yoga styles were significantly different, n = 8, χ2 (2) = 15.55, p < 0.001. 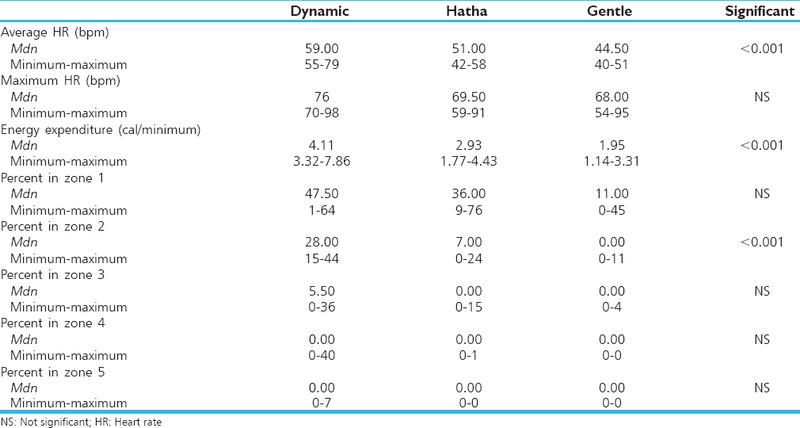 Follow-up analysis showed that average HR in Dynamic Yoga (Mdn = 59.00) was higher than Average HR in Hatha (Mdn = 51.00), Z = −2.52, p < 0.01, and Gentle Yoga (Mdn = 44.50), Z = −2.53, p < 0.01. No significant difference was found in the average HR during Hatha (Mdn = 51.00) and Gentle (Mdn = 44.50), Z = −2.37, p < 0.05. Per minute calorie expenditure in the three yoga styles was also significantly different, n = 8, χ2 (2) = 16.00, p < 0.001. Follow-up pairwise comparison showed that per minute energy expenditure in Dynamic (Mdn = 4.11) was higher than Hatha (Mdn = 2.93), Z = −2.52, p < 0.01, and Gentle (Mdn = 1.95), Z = −2.52, p < 0.01. No significant difference was found between Hatha and Gentle Yoga. The percentage of time spent in Zone 2 was significant, n = 8, χ2 (2) = 13.61, p < 0.001. Follow-up pairwise comparison showed that time spent in Zone 2 in Dynamic (Mdn = 28.00) was longer compared to Hatha (Mdn = 7.00), Z = −2.32, p < 0.01, and Gentle (Mdn = 0.00), Z = −2.52, p < 0.01. No significant difference was found between Hatha and Gentle Yoga. These results show that for the participants in this study, Hatha Yoga and Gentle Yoga were very light-intensity physical activity while Dynamic Yoga was a light-intensity activity (Polar Electro, 2018b). These results are also consistent with previous studies (Cowen & Adams, 2007; Cramer et al., 2016). Examining the range of the average HR in Dynamic Yoga also suggests that it may have potential to be a mild aerobic activity. Dynamic Yoga included several rounds of Surya Namaskar sequence that may result to the higher exercise intensity (Mody, 2011). As demonstrated in Sherman et al. (2017) study, Vinyasa Yoga is comparable to brisk walking in terms of energy expenditure. Acute psychological responses to each yoga style were collected before and after each session. Data were then compared within and then across three yoga styles. [Table 3], [Table 4], [Table 5] present the pre- and posttest EFI scores within each yoga style. Wilcoxon signed-rank tests were performed to compare pre- and posttest scores in each of the EFI subscales. Results showed that for positive engagement, pretest score (Mdn = 1.83) was significantly different from the posttest score (Mdn = 1.33), Z = −2.04, p < 0.05. For revitalization, pretest score (Mdn = 1.33) was also significantly different from the posttest score (Mdn = 1.00), Z = −2.23, p < 0.05. No significant difference was found between the pre- and posttest scores of tranquility and physical exhaustion subscales. Results showed that for positive engagement, pretest score (Mdn = 1.67) was significantly different from the posttest score (Mdn = 1.00), Z = −2.21, p < 0.05. For physical exhaustion, pretest score (Mdn = 1.33) was also significantly different from the posttest score (Mdn = 2.00), Z = −2.23, p < 0.05. No significant difference was found between the pre- and posttest scores of revitalization and tranquility subscales. Results indicated that for positive engagement, pretest score (Mdn = 1.00) was significantly different from the posttest score (Mdn = 0.33), Z = −2.21, p < 0.05. For tranquility, pretest score (Mdn = 0.83) was also significantly different from the posttest score (Mdn = 1.67), Z = −2.04, p < 0.05. For physical exhaustion, pretest score (Mdn = 1.17) was also significantly different from the posttest score (Mdn = 1.33), Z = −2.03, p < 0.05. No significant difference was found between the pre- and posttest scores of revitalization subscale. Participants reported decreased positive engagement after each session in all three yoga styles. Items within this subscale were enthusiastic, happy, and upbeat. They also reported lower revitalization after Dynamic Yoga and higher physical exhaustion after Hatha Yoga. However, they reported higher tranquility after Gentle Yoga. These results are inconsistent with what Smith et al. (2011) found except tranquility. One possible explanation for this could be that participants felt passive, droopy, and sleepy after each session, and only Gentle Yoga made them more calm, peaceful, and relaxed. Difference of post- and presession scores for each EFI subscale was computed. These were then compared between styles using Friedman tests [Table 6]. Results indicated that only change in tranquility was significant, n = 6, χ2 (2) = 8.00, p < 0.05. Follow-up pairwise comparison using Wilcoxon signed-rank tests indicated that tranquility change in Gentle Yoga (Mdn = 0.83) was significantly different from Dynamic Yoga (Mdn = 0.00), Z = −2.04, p < 0.05, and Hatha Yoga (Mdn = 0.00), Z = −2.06, p < 0.05. Change in tranquility between Dynamic and Hatha was not significantly different. However, if Bonferroni-corrected p-value is applied (i.e., pcorrected < 0.02), all follow-up tests were not significant. Nevertheless, results suggest that an acute session of Gentle Yoga results in feelings of tranquility. This study examined the physiological and psychological responses to three different styles of yoga as performed by novice practitioners. Specifically, training intensity, energy expenditure, and acute psychological response were observed in the performance of Dynamic Yoga, Hatha Yoga, and Gentle Yoga. In general, this study found that different styles of yoga elicit different training intensities and psychological response which is consistent with previous studies (Cowen & Adams, 2005; Cowen & Adams, 2007). Yoga styles that are dynamic in nature and incorporate sequences like the sun salutation (e.g., Ashtanga, Vinyasa, power) are more intense than other general styles of yoga and therefore may have some mild cardiovascular benefits (Mody, 2011). These styles of yoga may also count in the recommended amount of physical activity for health if practiced for at least 10 min per session (Sherman et al., 2017; World Health Organization, 2010). Park et al. (2016) reported that people practice yoga for exercise and stress relief reasons. Dynamic Yoga may be more appropriate for those practicing yoga for exercise reasons. However, gentle styles (e.g., Yin, restoratives) may be more appropriate for those seeking relaxation. A small but novel contribution of the present study is the use of centralized control of the HRMs. Previous studies used wrist watch-paired HRMs and participants controlled the gadgets which may have affected accuracy of the recordings (Cowen & Adams, 2007). Other factors affecting exercise HRs such as hydration status and room temperature were not considered in the present and may be important to examine in future studies (Achten & Jeukendrup, 2003; Gilman, 1996). Very few studies have compared physiological responses to different yoga styles, and none thus far has examined if changes in affect are similar across styles until this study. However, the use of only one instrument to measure changes in exercise-induced feelings may be insufficient. Ekkekakis and Petruzzello (2001) recommended the use of additional inventories to measure exercise feelings in future studies. Future studies also need to examine long-term benefits of different yoga styles. Yoga has become a staple physical activity program in most health and fitness centers worldwide (Thompson, 2017), and it has the potential to be low-cost intervention for health promotion, stress management, and disease prevention (Siegel et al., 2016). Understanding the benefits of different yoga styles may guide physical educators, sports science and human movement specialists, as well as other allied health professionals to prescribe the appropriate yoga style that would meet the goals of their students or clients. This study was financially supported by the University of the Philippines Diliman Outright Research Grant. Participants of this study were students of physical education courses that I taught in the semester of data collection. The participants were, however, informed that their participation was entirely voluntary and would not in any way affect their grades at the end of the semester. Achten, J., & Jeukendrup, A. E. (2003). Heart rate monitoring: Applications and limitations. Sports Medicine, 33 (7), 517-538. doi: 10.2165/00007256-200333070-00004. Ainsworth, B. E., Haskell, W. L., Herrmann, S. D., Meckes, N., Bassett, D. R., Jr., & Tudor-Locke, C.,... Leon, A. S. (2011). 2011 compendium of physical activities: A second update of codes and MET values. Medicine & Science in Sports & Exercise, 43 (8), 1575-1581. doi: 10.1249/MSS.0b013e31821ece12. American College of Sports Medicine. (2010). ACSM's guidelines for exercise testing and prescription (8th ed.). US: Lippincott Williams & Wilkins. Bennett, H., Parfitt, G., Davison, K., & Eston, R. (2016). Validity of submaximal step tests to estimate maximal oxygen uptake in healthy adults. Sports Medicine, 46 (5), 737-750. doi: 10.1007/s40279-015-0445-1. Blank, S. E. (2006). Physiological responses to Iyengar yoga performed by trained practitioners. Journal of Exercise Physiology Online, 9 (1), 7-23. Corder, G. W., & Foreman, D. I. (2014). Nonparametric statistics: A step-by-step approach. US: John Wiley & Sons. Cowen, V. S., & Adams, T. B. (2005). Physical and perceptual benefits of yoga asana practice: Results of a pilot study. Journal of Bodywork and Movement Therapies, 9 (3), 211-219. doi: 10.1016/j.jbmt.2004.08.001. Cowen, V. S., & Adams, T. B. (2007). Heart rate in yoga asana practice: A comparison of styles. Journal of Bodywork and Movement Therapies, 11 (1), 91-95. doi: 10.1016/j.jbmt.2006.08.001. Cramer, H., Lauche, R., & Dobos, G. (2014). Characteristics of randomized controlled trials of yoga: A bibliometric analysis. BMC Complementary and Alternative Medicine, 14 (328),1-20. doi: 10.1186/1472-6882-14- 328. Cramer, H., Lauche, R., Langhorst, J., & Dobos, G. (2016). Is one yoga style better than another? A systematic review of associations of yoga style and conclusions in randomized yoga trials. Complementary Therapies in Medicine, 25, 178-187. doi: 10.1016/j.ctim.2016.02.015. Devereux, G. (1999). Dynamic Yoga: The Ultimate Workout that Chills mind as it Changes your Body (1st ed.). UK: Thorsons Publishing, Ltd.
Ekkekakis, P., & Petruzzello, S. J. (2001). Analysis of the affect measurement conundrum in exercise psychology: II. A conceptual and methodological critique of the exercise-induced feeling inventory. Psychology of Sport & Exercise, 2, 1-26. Gauvin, L., & Rejeski, W. J. (1993). The exercise-induced feelings inventory: Development and initial validation. Journal of Sport & Exercise Psychology, 15, 403-423. Gilman, M. B. (1996). The use of heart rate to monitor the intensity of endurance training. Sports Medicine, 21(2), 73-79. doi: 10.2165/00007256-199621020-00001. Hagins, M., Moore, W., & Rundle, A. (2007). Does practicing hatha yoga satisfy recommendations for intensity of physical activity which improves and maintains health and cardiovascular fitness? BMC Complementary and Alternative Medicine, 7, 40. doi: 10.1186/1472-6882-7-40. Hewett, Z. L., Ransdell, L. B., Gao, Y., Petlichkoff, L. M., & Lucas, S. (2011). An examination of the effectiveness of an 8-week bikram yoga program on mindfulness, perceived stress, and physical fitness. Journal of Exercise Science & Fitness, 9 (2), 87-92. doi: 10.1016/s1728-869x(12)60003-3. Jois, S. K. (2010). Yoga mala. US: North Point Press. Larson-Meyer, D. E. (2016). A systematic review of the energy cost and metabolic intensity of yoga. Medine & Science in Sports & Exercise, 48 (8), 1558-1569. doi: 10.1249/MSS.0000000000000922. McArdle, W. D., Pechar, G. S., Katch, F. I., & Magel, J. R. (1973). Percentile norms for a valid step test in college women. Research Quarterly. American Association for Health, Physical Education and Recreation, 44 (4), 498-500. doi: 10.1080/10671188.1973.10615230. Mody, B. S. (2011). Acute effects of Surya Namaskar on the cardiovascular & metabolic system. Journal of Bodywork & Movement Therapies, 15 (3), 343-347. doi: 10.1016/j.jbmt.2010.05.001. Park, C. L., Riley, K. E., Bedesin, E., & Stewart, V. M. (2016). Why practice yoga? Practitioners' motivations for adopting and maintaining yoga practice. Journal of Health Psychology, 21 (6), 887-896. doi: 10.1177/1359105314541314. Polar Electro. (2018a). H7 heart rate sensor. Retrieved from: https://www.support.polar.com/au-en/support/H7_heart_rate_sensor. [Last accessed on 2018 Aug 10]. Polar Electro. (2018b). Polar heart rate zones. Retrieved from: https://www.support.polar.com/au-en/support/tips/Polar_Sport_Zones. [Last accessed on 2018 Aug 10]. Polar Electro. (2018c). Polar team app. Retrieved from: https://www.support.polar.com/au-en/support/polar_team_app. [Last accessed on 2018 Aug 10]. Ross, A., & Thomas, S. (2010). The health benefits of yoga and exercise: A review of comparison studies. The Journal of Alternative and Complementary Medicine, 16 (1), 3-12. doi: 10.1089/acm.2009.0044. Sherman, S. A., Rogers, R. J., Davis, K. K., Minster, R. L., Creasy, S. A., & Mullarkey, N. C.,... Jakicic, J. M. (2017). Energy expenditure in vinyasa yoga versus walking. Journal of Physical Activity and Health, 14 (8), 597-605. doi: 10.1123/jpah.2016-0548. Siegel, P., Goncalves, A. V., da Silva, L. G., Bartolomei, L., Barreto, M. J., & Furlanetti, M. R.,... de Barros, N. F. (2016). Yoga and health promotion, practitioners' perspectives at a Brazilian university: A pilot study. Complementary Therapies in Clinical Practice, 23, 94-101. doi: 10.1016/j.ctcp.2015.05.005. Smith, A. J., Greer, T., Sheets, T., & Watson, S. (2011). Is there more to yoga than exercise? Alternative Therapies in Health and Medicine, 17 (3), 22-29. Spadola, C. E., Rottapel, R., Khandpur, N., Kontos, E., Bertisch, S. M., & Johnson, D. A.,... Redline, S. (2017). Enhancing yoga participation: A qualitative investigation of barriers and facilitators to yoga among predominantly racial/ethnic minority, low-income adults. Complementary Therapies in Clinical Practice, 29, 97-104. doi: 10.1016/j.ctcp.2017.09.001. Stiles, M. (2000). Structural yoga therapy: Adapting to the individual [Kindle version]. In. Retrieved from: http://www.amazon.com. [Last accessed on 2018 Aug 10]. The Sivananda Yoga Center. (2000). The Sivananda Companion to Yoga: A Complete Guide to the Physical Postures, Breathing Exercises, Diet, Relaxation, and Meditation Techniques of Yoga. UK: Touchstone/Simon & Schuster Publishing. Thompson, W. R. (2017). Worldwide survey of fitness trends for 2018. ACSM's Health and Fitness Journal, 21 (6), 10-19. doi: 10.1249/FIT.0000000000000341. World Health Organization. (2010). Global recommendations on physical activity for health. Geneva, Switzerland: WHO Press. Retrieved from: http://www.who.int/dietphysicalactivity/publications/9789241599979/en/. [Last accessed on 2018 Aug 10]. World Health Organization. (2013). WHO traditional medicine strategy: 2014-2023. Geneva, Switzerland: WHO Press. Retrieved from: http://www.who.int/traditional-complementary-integrative-medicine/publications/trm_strategy14_23/en/. [Last accessed on 2018 Aug 10]. World Medical Association. (2013). World Medical Association Declaration of Helsinki: Ethical principles for medical research involving human subjects. Journal of American Medical Association, 310 (20), 2191-2194.